According to officials, there was no immediate claim of responsibility for Boston Marathon explosions, but a Saudi suspect was arrested at the scene. Meanwhile an official told CNN that there was no surveillance footage of the bombs being planted. However, on Monday night, 20 police and federal officials, including members of the bomb squad raided a Boston area apartment. A source confirmed that a large police presence at a home in Revere was related to the Boston Marathon bombings. Boston Police Crime Scene Response unit arrived and two members of that unit took several brown paper bags, normally used to store evidence taken from the scene, into the building and left with them full afterwards. On Monday, the FBI announced they were searching for a man they described as having dark skin, wearing black clothes and a black back-pack who tried to gain entry into a restricted area during the marathon. It was also reported that he may have had a foreign accent. The raid came after a Saudi national, who is being treated for burns and shrapnel wounds at hospital, was arrested at the scene. He had been tackled by a civilian who believed he was acting suspiciously, and he was being interviewed by the FBI. The Saudi suspect was being cooperative and denying any involvement. Initially counter-terrorism sources in Boston believed that seven devices were planted across the city – but only two detonated. A law-enforcement official said late on Monday evening that investigators believe other packages were simply left behind as runners and pedestrians rushed away from the scene in the aftermath of the blasts. 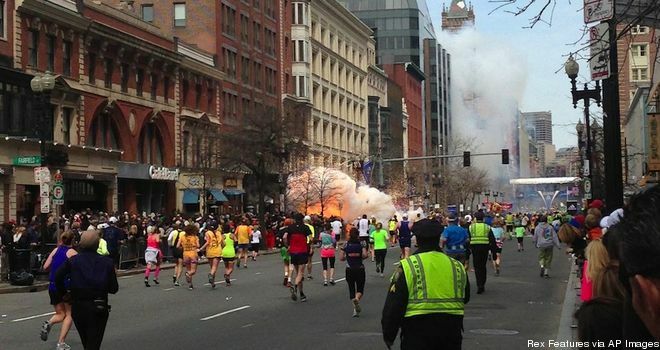 A federal law enforcement official told CNN that both bombs which detonated at the Boston Marathon finish line were small, and initial tests showed no C-4 or other high-grade explosive was used – indicating they were crude devices. Boston police initially issued an alert for a rental van that may have sought access to the marathon route, and then another alert for a man wearing dark clothing and a hood who was seen leaving the scene of the blasts. The two bombs raised the specter that terrorism has struck again in the U.S.
After the twin detonations ripped through the cheering crowds, witnesses described the horror. The fiery twin blasts took place about 12 seconds and about 100 yards apart, knocking spectators and at least one runner off their feet, shattering windows and sending dense plumes of smoke rising over the street and through the fluttering national flags lining the route. The explosions ripped into an idyllic afternoon finish for the marathon. The first men had passed the finish line 2 hours and 10 minutes after the staggered start, and the first women crossed just 16 minutes later. The first blast sent a quick plume of smoke two stories high. Runners nearby stopped in their tracks, confused and unsure. After a few seconds later, a second explosion happened a half-block away, with a deep boom caught on television cameras.